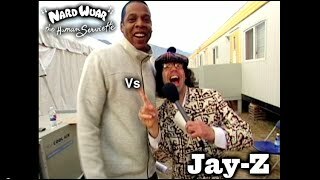 Nardwuar vs. Jay-Z - The Extended Version Views: 1278016 Nardwuar interviews Jay Z at The Pemberton Music Festival, British Columbia, Canada ! Nardwuar vs. Asher Roth ... Nardwuar vs. Jay-Z - The Extended Version 6 years ago. 00:10:00. Nardwuar vs. Common - The Extended Version 6 years ago.